The theory of networks aims at developing theoretical views on the design and management of alliances, franchise chains, licensing, joint ventures, cooperatives, and venture capital relations. The current trend in economics and management of networks is twofold: First there is a strong tendency toward application of theoretical approaches developed both in organizational economics, strategic management and organization theory. The second trend refers to the development of more integrative views on networks. Especially, combining organizational economics, strategic management and relational views on networks are very promising research directions. 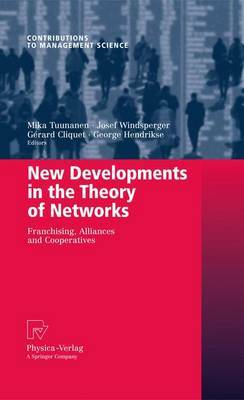 Starting from this status of research, the current book emphasizes network research as a theory-driven field by offering new perspectives on contract design, decision and ownership rights, value creation, knowledge management and the role of social capital in franchising networks, alliances and cooperatives.